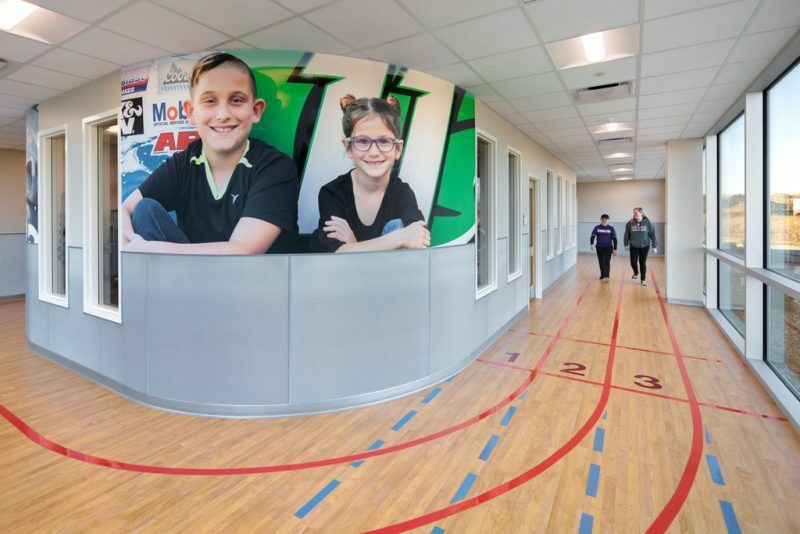 A larger-than-life mural of patients and sisters Kendal and Makenzie Yovanovich greets patients in the new Akron Children’s Hospital Pediatrics (ACHP) Mansfield office. The Akron Children’s Health Center, Mansfield is taking shape inside and out. 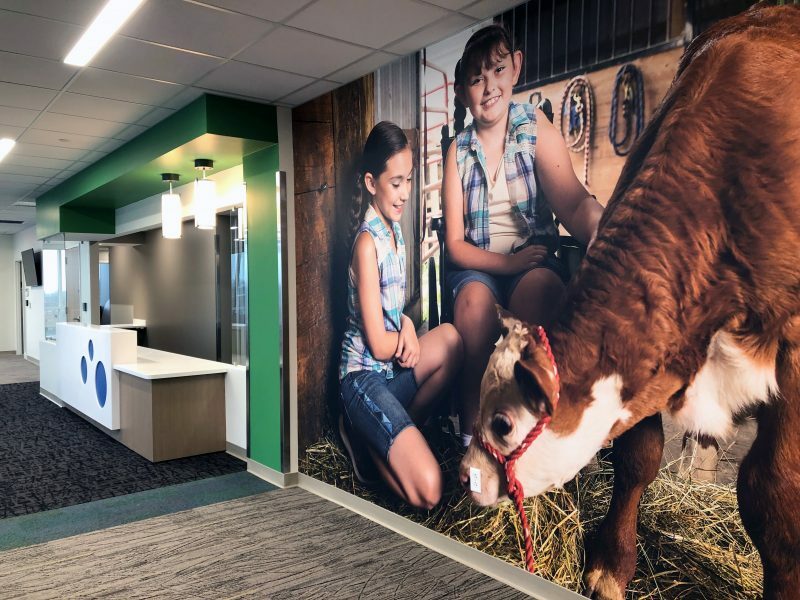 Artwork, signage and building materials have been carefully selected to compliment Akron Children’s kid-focused care with paint colors and images of farmland, race cars and a carousel that pay homage to Richland County’s character and charm. When patient families enter the center, they will immediately notice an abundance of natural light and a whimsical audio-kinetic sculpture by contemporary artist George Rhoads, whose “Incrediball Circus 2” has delighted children in the lobby of the hospital’s Akron campus for nearly 3 decades. 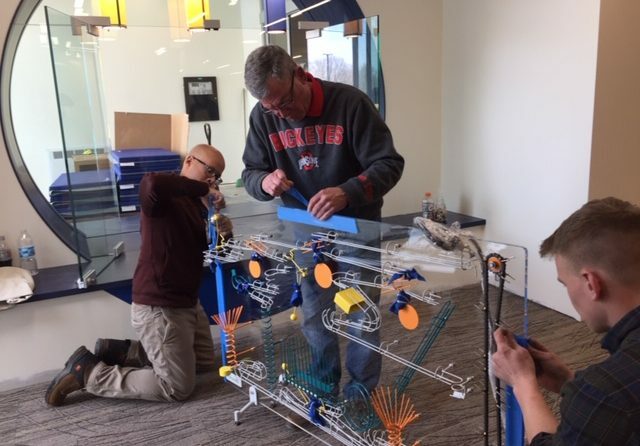 A team works to assemble and place the new audio-kinetic sculpture in the lobby of the new Akron Children’s Health Center, Mansfield. Just beyond the sculpture, at the center’s welcome desk, visitors can admire the carousel animals featured on the wall. The animals featured in the picture are from the Akron Zoo carousel, which was made locally by Mansfield’s Carousel Works, the largest manufacturer of wooden carousels in the world. An image of Mansfield’s Carousel Works at the zoo helps welcome families. As patients enter Akron Children’s Hospital Pediatrics, art featuring various animals will greet them. The famous farm and country home of Louis Bromfield and Malabar Farm served as inspiration for the farmland theme, and celebrates the natural beauty and history of working farms. The Urgent Care area uses splashes of the Akron Children’s blue color for its “pond” theme. Special photography brings water elements into the space and draws attention to Richland County’s rich park history, including Mohican State Park and Clear Fork Reservoir. Water-themed images adorn the walls of the new Urgent Care space. 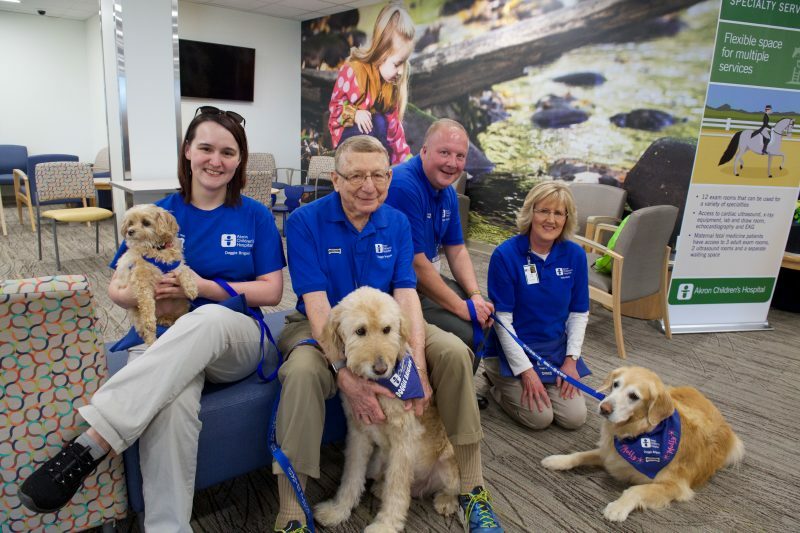 Here, Doggie Brigade teams pose for a photo during the open house. Playing on Mansfield’s official nickname, “The Fun Center of Ohio,” the interior of Rehabilitation Services was inspired by Mid-Ohio Sports Car Course. The therapy and sensory areas feature lots of windows to allow plenty of natural light in the space, while large murals of children and race cars encourage “fun” along an indoor exercise track. Patients Zak and Kendal Ostapowicz are featured on the racing mural in the facility’s indoor track for rehabilitation patients. Accents of the historic Raemelton Therapeutic Equestrian Center, which provides therapeutic riding for individuals with mental, physical and emotional disabilities, can be seen in the theme of the center’s Specialty Services area. The butter yellow, white and green grass color scheme honors the farm’s founder, Frank Black and his wife, Jessie,whose favorite color was yellow. 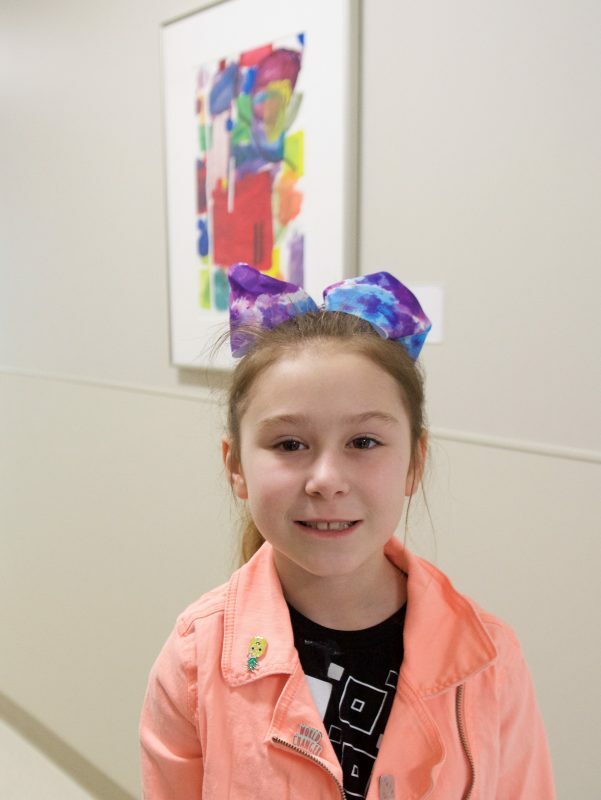 In addition to the fresh-air feel of the health center, local children’s art will also adorn the halls, which is a hallmark in all Akron Children’s locations. Layla Bryant, 8, of Shiloh, is proud of her artwork from second grade on display in the office. 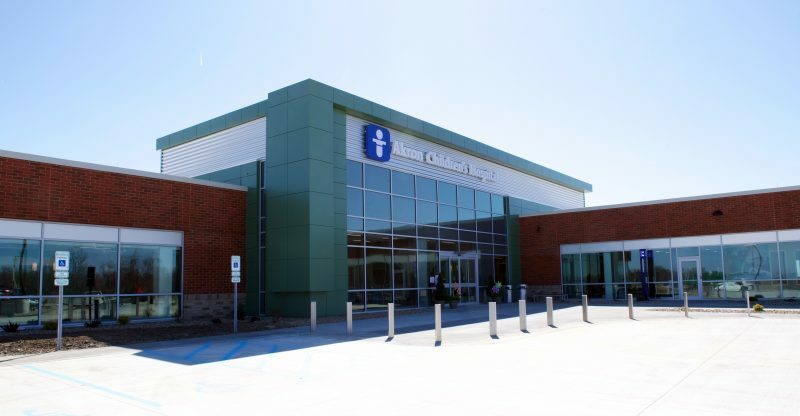 The community is invited to tour Akron Children’s Health Center, Mansfield on Saturday, March 23, from 9:30 a.m. – noon with a ribbon-cutting ceremony at 11 a.m. The event is free and open to the public and features self-guided tours, light refreshments and family entertainment.